I was wandering through the streets in the old part of Bristol today with some friends and we came across some pretty almshouses. The were behind closed gates so it was difficult to get a good view but these stone carvings were set in the brick on the first floor. They are the Magi, carrying their gifts of Gold, Frankincense and Myrhh. I thought they were perfect for Ailsa’s challenge this week. 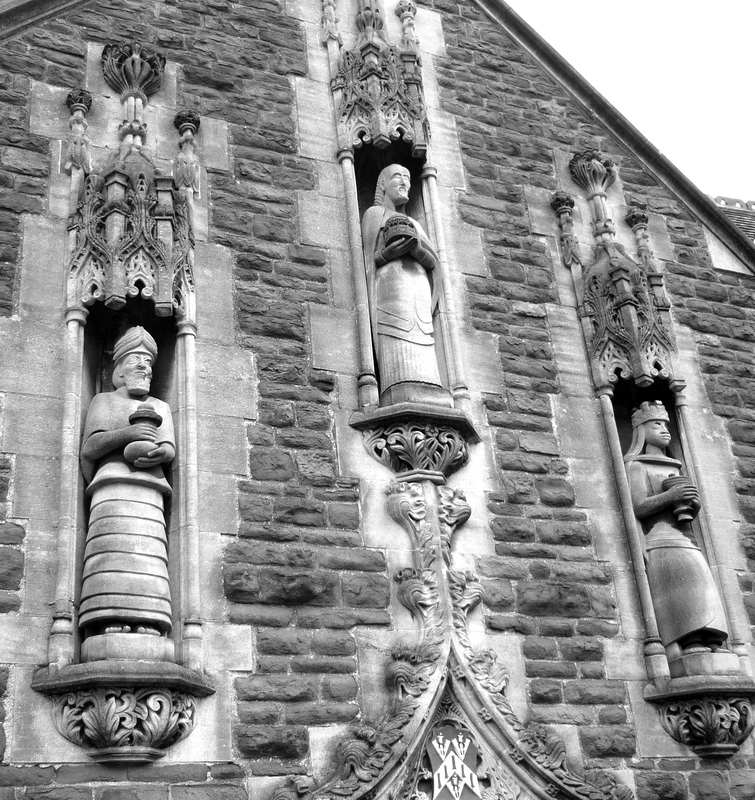 I am wondering why these particular people were carved in stone on these almshouses. Any idea? Colline, my guess as to why the magi were carved on the almshouse is that they represent the giving of gifts to the Lord, and the Word of God teaches that when we give to the poor, we give to the Lord. (Matt. 25:40 and Prov. 19:17). I feel sure that’s why these particular people were chosen. What you say makes sense. Thank you for answering my question. OH yes, they are absolutely perfect for the challenge, Gilly. Aren’t the Magi wonderful – they look quite contemporary. I love them! They have a very pretty setting as well! A great response to the prompt, Gilly. And very good photography work if you had to get this shot around closed gates. The detail really stands out in your black and white photo!! Marvelous! I love how the more contemporary (as M says) figures contrast with the older decorative stone niches … a lovely shot through closed gates! Thanks Sylvia, it was a very pretty place! There’s a link on today’s post! You have a fantabulous photographer’s eye and always manage to present the most interesting pictures. I’ve never seen anything like this. I believe it’s fitting that the Magi are present here. I thought you might have seen them before, you’re not so far away. Yeh, I now know the building is in Bristol but I wouldn’t go out of my way to see it; not my sort of thing. Impressive how the blogosphere generates it own momentum. I’ve been meaning to say how impressed I am with your blog output. I have no idea how you cope with the administration of it and all the other things you do. They are definitely stone. You picked a wonderful image to showcase the challenge. taken to create them is a work of art all on it’s own. Super, Gilly …. The three kings! I wonder i it shows a star in reference to the one they followed to find the manger. Great find. Do you know why they were chosen for the almshouses? I love them: so stylised and beautifully showcased against the highly textured cut stone of the structure itself. Terrific response Gilly. A wonderful example of stone and I loved reading Paula’s response. Thanks for the education. Hm, this is something else!